It is not unusual to find oneself in a state of abeyance, quiet suspension, while waiting for treatment in any health center. It’s a moment of emotional discomfort, sometimes exacerbated by the visual dullness of the surroundings and the buzzing of television screens. The Memorial Sloan Kettering art program, curated by Jay Davis, provides an ever-changing visual context to accompany patients through their treatment process. At the MSK Brooklyn Infusion Center on Atlantic Avenue, the art program encourages artists to rethink the usual “framed art on the walls” practice. The patient waiting area is a vast open gallery on the street level, bathed in daylight, not at all the traditional waiting room. The space links street bustle and health staff activity, and while the patients receive care in privacy and calm, they are still connected to the outside. My art installation feeds on this duality: the reflective surface of the “Fusion Mandalas” mirror the street activity of cars and pedestrians, while their motion-sensor triggered random rotation echos the unseen activity that occurs in the treatment rooms. Sensors are installed near the reception desk and the treatment areas, not near the Mandalas, so that staff and patients at work and treatment trigger slow and subtle rotations of the Mandalas that are unpredictable, without pattern. Fracture, Fusion, & Form is an installation of nine individual rotating collages referred to by Galiana as, “Fusion Mandalas.” Created from everyday color-coding dot stickers, the “Fusion Mandalas” seek to investigate the role of balance within a meditative process, both in the artist’s act of creation and the viewer's subsequent contemplation. As a traditional Hindu and Buddhist symbol utilized for meditation, a “mandala” represents the universe in an intricate, harmonious circle, beginning with the center dot, or “Bindu,” as the point of all creation. Galiana meticulously constructs her mandalas using divergent structures and colliding grids that aim to confront the notion of harmony. 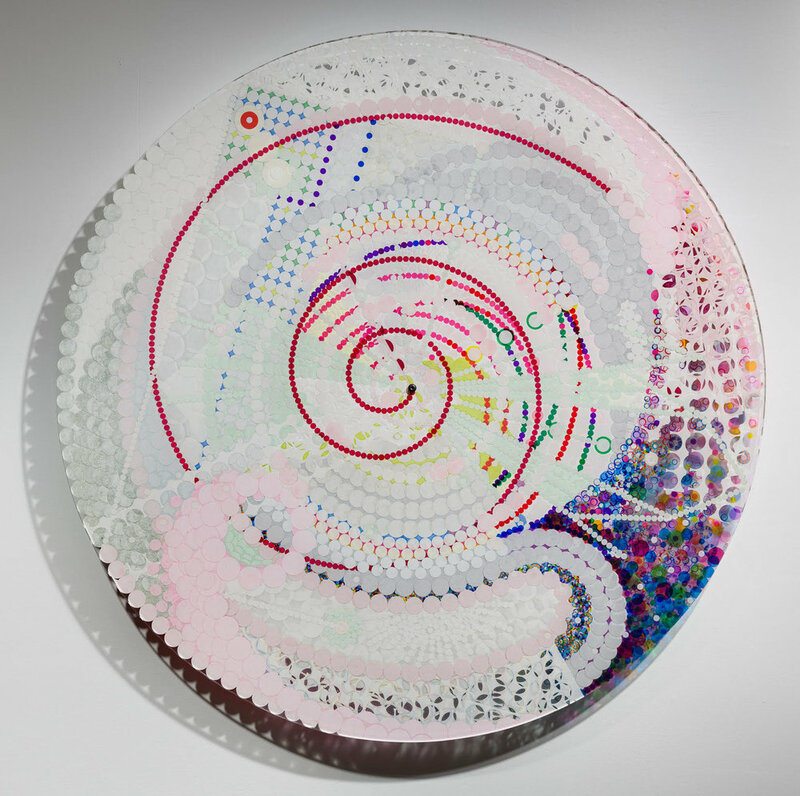 By employing dot stickers, commonly used to organize, the artist invokes a mortal presence within an otherwise cosmic intention. The stickers also question the placement of the “Bindu” and present a prosaic visualization of the universe as alternative to the sacred, both in medium and design. The Mandalas are activated by motion detectors and stay activated for a few seconds in a random manner. The rotation of each mandala serves not only to amplify the infinite and chaotic nature of the universe, but to unify its disparate parts into a whole.The process of considering the work in a meditative sense reinforces Galiana’s universe as one in which humans possess only influence rather than control.